The irony of the British pub companies (pubcos) is that despite having two significant characteristics that are particularly desirable for long-term buy-and-holding they have been fairly poor investments over the past decade or so. Not only is the pub industry facing extremely tough trading conditions these days, but in more than a few cases the pubcos took on disastrous levels of debt before the 2007 financial crisis. Firstly though let’s look at what I would call the two good points. One is that many of these stocks can trace their business histories back to at least the 19th century, and in a few cases they go back well into the 1700s (it’s a pretty ubiquitous and everlasting product after all). The second is that in the United Kingdom the alcohol sector has traditionally delivered the best investment returns over the past century or so (in the United States the equivalent sector was tobacco). A £1,000 investment made in the UK alcohol sector at the start of the 20th century (£110,000 in inflation adjusted 2016 Sterling) would have been worth around £245 million by 2015. That’s equal to average returns of approximately 11.5% per year. For much of that history many of the big alcohol stocks were basically conglomerates; more specifically they controlled both the breweries and the pubs. Now from a business (and shareholder) perspective you can see what it would attractive to control both the manufacturing and distribution aspect of things as it guarantees your particular brand of beer is getting sold. Eventually this was deemed to be too monopolistic by the powers that be in the UK and so began the divestitures and spin-offs that helped shape the current landscape. Essentially today what we have are the producers, pubcos and a few hybrid stocks. I’ve already written a couple of pieces on the beer stocks and Diageo. To summarise: their balance sheets are stuffed full of intangible assets, they report very high quality earnings and, from an investing perspective, they are the most attractive assets to buy at the right price. The pubcos on the other hand are generally characterized by the huge amounts of the debt they accrued in the build up to the financial crisis; something which has proved to be incredibly destructive to their shareholders. There are also some regulatory issues in that the historic tied model (the practice of pub tenants buying beer/alcohol from landlords at inflated prices in return for reduced rents) has now been severed. That said there are a couple of companies that stand out a little bit, one of which is Greene King (LON: GNK). Step in a time machine and set the dashboard clock to England, 1799. King Georg III was on the throne and the income tax had just been introduced for the very first time by Tory prime minister William Pitt the Younger. For those who are interested the rate was set at two shillings in the pound on incomes over £60, increasing progressively to two shillings in the pound for incomes over £200. It’s also the year that 19 year old Benjamin Greene moved to the market town of Bury St Edmonds to set up his brewing business. 88 years later it would go on to merge with Frederik King’s St. Edmunds Brewery to form Greene, King and Sons; precursor to the modern day business that encompasses around 3,000 pubs and restaurants and a handful of some of the best known national ale brands. The modern day Greene King is something of a hybrid in that it generates revenues from three segments: Pub Company, Pub Partners and Brewing & Brands. The Pub Company segment essentially comprises the 1,822 properties that Greene King actively manages in England, Scotland and Wales. In the first half of fiscal year 2017 the segment generated £855.9 million in revenue, or roughly 80% of the company total. Pub Partners represents the 1,210 pubs that are either operated on long-term leases or shorter-term tenancy from Greene King. Essentially this the pubco business model in which they basically act as glorified property companies. In the first half of FY 2017 it was responsible for £93.6 million of the company’s revenue. Completing the business is the Brewery & Brands segment; which is the collection of beers owned and brewed by the company, including Greene King IPA, Old Speckled Hen and Abbot Ale. Together that brought in £94.8 million in revenue over the first six months of the financial year. Put it all together we’re left with around £1.05 billion in revenue over the first half of FY 2017 of which £111.3 million ended up on the bottom line as net-income. Now at this point I’ll freely concede that this isn’t going to be super quality buy-and-hold stock. Its returns on capital are unspectacular and the underlying business isn’t particularly capital light (which is ultimately a big plus if you’re after a long-term dividend stock). You can’t even look to long-term growth to get too excited about Greene King either. At the turn of the century the company was bringing in revenue of £415 million of which £41.8 million ended up as net profit. On a trailing-twelve-month basis revenues are now approximately £2.1 billion and net profit is £195 million. That’s equivalent to a compounded average earnings growth rate of 10%. Sounds pretty good, but what you also have to take into consideration is that the share count has also grown from around 140 million to 295 million today (adjusted for stock splits) as much of the growth has been fuelled by acquisitions. Last year (i.e. fiscal year 2016) the company earned around 70 pence per share in net income. On a per share basis the comparable growth rate is therefore around 5.50% since 2000. That said there are a couple of noteworthy points worth mentioning. First off is the dividend growth record. The only dividend “cuts” over the past couple of decades are connected to a three-for-five rights issue undertaken in 2009 to buy back bonds and acquire cheap pub properties from struggling pubcos. Strictly speaking they have raised their annual distribution in each year going back to at least 1996. The dividend growth rate over that time has been 5.1% per year; not gangbusters growth by any means, but for anyone familiar with the travails of the British pub industry that’s actually a heck of a record. The second point is the fact that economic slumps and recessions tend to throw up great investing opportunities that fully discount the fact that growth isn’t going to be stellar. Returns since the back end of 2008, for example, have been around 15% per annum assuming reinvested dividends. Finally, I like the fact the company can trace its history all the way back to 1799. The backdrop to that being that the U.K. pub industry in a state of long-term secular decline. In 1980 there were around 70,000 pubs open across the United Kingdom. That figure is now around the 50,000 mark. Despite that, Greene King’s like-for-like sales (i.e. same pub sales excluding disposals and acquisitions) continue to grow. Its better positioned in that their brands are exposed to serving food – a sector of the economy that is still growing – as opposed to purely serving drinks (beer drinking in pubs in the U.K. continues to decline in the face of much cheaper alternatives from supermarkets). Granted, Greene King is not going to be one of your core British dividend stocks. That space is reserved for the likes of Unilever, Diageo, Reckitt Benckiser, GlaxoSmithKline, British American Tobacco and Imperial Brands. Maybe even throw in BP and Royal Dutch Shell if you don’t mind investing in commodity stocks. But if you’re after a company that’s been part of the furniture in Britain for a couple of hundred years then it’s worth a look whenever it goes on deep discount. 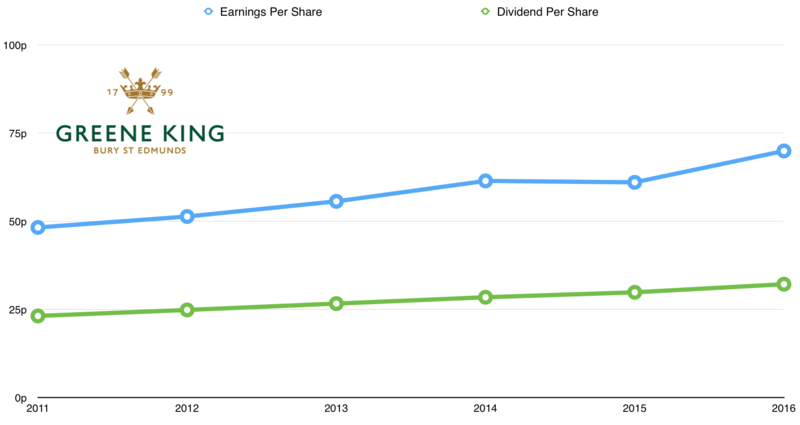 At 9.75x earnings and a 4.75% dividend yield it’s probably somewhere on the cheaper side of fair value right now.